Contra Costa's Los Vaqueros Reservoir was completed in 1998, the last large-scale dam to be built in the 9 counties surrounding the SF Bay. 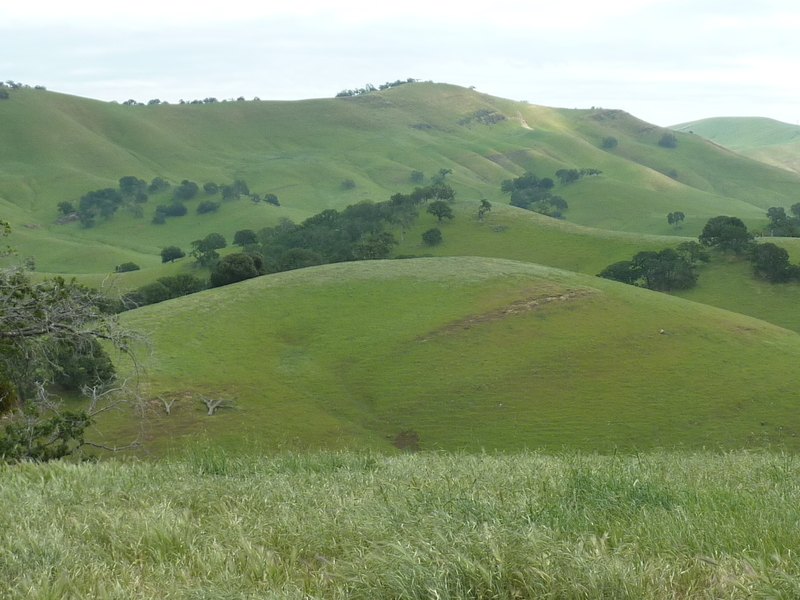 Located in the grassy hills north of Livermore, the area has been primarily used for ranching over the past century (and continues still, even in the reservoir watershed). Over the past 30yrs, Open Space areas have been acquired, connecting hiking trails to Mt. Diablo State Park to the west. This was my first visit to the reservoir since it was built, my recently retired cousin along for the fun. I was after two unnamed summits on the north side of the reservoir that were accessible from the trail system within the Los Vaqueros Watershed. The first of these has no trail or road going to the summit, requiring about 300ft of cross-country gain to reach the open, grass-covered top. The second has trails (mostly ranch roads) running along the ridgeline and the very summit where several view benches are found and, oddly, a restroom. There are fine views overlooking the reservoir to the south and the community of Brentwood in the Central Valley to the northeast. Cloud cover hampered views of Mt. Diablo to the northwest. We spent about 4.5hrs on the hike, including a half hour stop atop Peak 1,272ft for a picnic lunch. The marina on the west end of the lake where we parked offers rental boats and fishing poles and a well-stocked bait shop - the place appears to be far more popular with anglers than hikers, judging by this one visit, but the green hills made for fine hiking scenery.